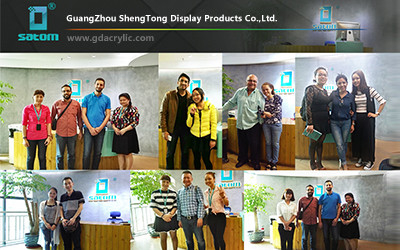 Guangzhou Sheng Tong Display Products Co., Ltd, founded in 1998, is a leading manufacturer in advertising display industry with more than 14 years production experience in China. With acrylic workshop, wood craft workshop, metal process workshop, spraying&printing room, mould injection R&D team, 60 well trained workers and complete quality control system, our factory provide OEM and ODM service for many global partners. 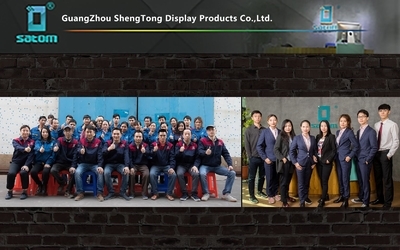 We have been committed to developing innovative products, currently we have gained 11 patents of utility model in LED neon sign, Wine display and Cigarette display (1 patent for invention). Our factory have full series of products and strong R&D innovation capabilities. Every year hot sale products are being lanched, including LED neon sign series, Wine display series, Cigarette display series, Product display stand, Ice bucket, Cosmetic display series, Backgammon set, Wood display products, etc. Our clients are given the same evaluation: Proving comprehensive design solution and high quality&favorable price goods as well. We sincerely hope to establish long term cooperation with more brands, distributors and traders to reach win-win business. You are warmly welcome to visit Satom Display in any time. Best raw material, latest equipment, well-trained & skillful workers, 100% inspection, together with safe packing,guaranteed the excellence of our products. Lacquer for hardware accessories meet RoHS standard. II. Well-trained & skillful workers. III.100% inspection for both semi-finished&finished products. Vision: Well-known brand in global advertising display industry. Mission: Create value for customers, create happiness for partners. Service: Satom was, is, and will always be your trustworthy business partner in China. 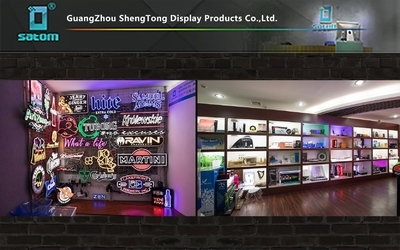 ShengTong Display has been specializing in advertising sign industry since 1998,which providing comprehensive design solution for LED neon sign and light box.We are the authority factory of the LED neon sign .With China independent intellectual property,We are constantly pursuing innovation and currently leading the LED neon sign industry. Serve global clients and invite them to profoundly cooperate with us,jointly develop with us and lead the market with us. Let us become trustworthy cooperated partners for each other. 1. 24 hours online service. 2. Support small order OEM&ODM customization. 3. Sample finished within 7days. 4. Provide one stop service from design, production, shippment to aftersale.